Joomla! (Popular) is one of the most powerful Open Source Content Management Systems on the planet. It is used all over the world for everything from simple websites to complex corporate applications. Joomla! 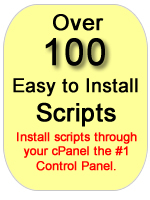 is easy to install, simple to manage, and reliable. Drupal (Popular) is software that allows an individual or a community of users to easily publish, manage and organize a great variety of content on a website. Drupal includes features to enable content management systems, blogs, collaborative authoring environments, forums, newsletters, picture galleries, file uploads and downloads and much more. WordPress (Popular) – is a state-of-the-art semantic personal publishing platform with a focus on aesthetics, web standards, and usability. WordPress started as just a blogging system, but has evolved to be used as full content management system and so much more through the thousands of plugins, widgets, and themes now available. BuddyPress will extend WordPress MU and bring social networking features to a new or existing installation, which SimpleScripts installs as a combination package. BuddyPress is a suite of WordPress plugins and themes, each adding a distinct new feature. Mambo is a full-featured, award-winning content management system that can be used for everything from simple websites to complex corporate applications. It is used all over the world to power government portals, corporate intranets and extranets, ecommerce sites, nonprofit sites, nonprofit outreach, schools, church, and community sites. mambo\’s “power in simplicity” also makes it the CMS of choice for many small businesses and personal sites. XOOPS is an acronym of eXtensible Object Oriented Portal System. Though started as a portal system, XOOPS is in fact striving steadily on the track of Content management System. It can serve as a web framework for use by small, medium and large sties. b2evolution is a powerful blog tool you can install on your own website. it includes all the features of traditional blog tools, and extends them with evolved features such as file & photo management, advanced skinning, multiple blogs support as well as detailed user permissions. Textpattern is a web application designed to help overcome hurdles to publishing online, and to simplify the production of well-structured, standards-compliant web pages. it is a flexible, elegant and easy-to-use content management system. NucleusCMS can set up one or more weblogs. If you want to, you can even show the contents of multiple weblogs on the same page. Each blog can have multiple authors and categories. There is a built in commenting system, fancy URLs, full post.comment searching, feed syndication, and much more. Nucleus is fully customizable and features a flexible plugin system for expansion. Geeklog is a PHP/MySQL based application for managing dynamic web content. “Out of the box”, it is a blog engine, or a CMS with support for comments, trackbacks, multiple syndication formats, spam protection and more. PHP-Nuke is an automated news system specially designed to be used in Intranets. The administrator has total control over the web site, registered users, and will have a powerful assembly of tools to maintain an active and interactive web site using databases. phpwcms is a robust and simple but yet powerful web based content management system running under PHP and MySQL. Pligg is an open source CMS that you can download and use for free. Pligg CMS provides social networking software that encourages visitors to register on your website so that they can submit content and connect with other users. Tiki Wiki CMS Groupware is a full-featured, web-based, multilingual, Wiki/CMS/Groupware. TikiWiki can be used to create all sorts of Web applications, sites, portals, intranets, and extranets. Highly configurable and modular, all the features are optional and administered via a web-based interface. Major features include articles, forums, newsletters, blogs, a file/image gallery, bug & issue tracker, a links directory, polls/surveys and quizzes, a FAQ, a banner management system, a calendar, maps, Mobile Tiki, RSS feeds, a category system, a theme control center, a workflow engine, live support, Shoutbox, an advanced user group and permission system and more.